Description: Stainless steel BBQ utensils with rubber grip handles for easy use. The aluminium case is supplied with a metal badge suitable for decorating. 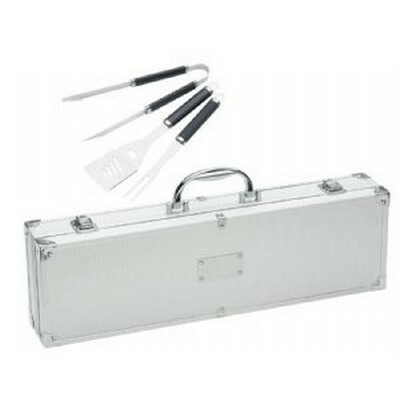 Features: Includes spatula, fork and tongs Packaging: Plain white tuck box. ?Packaging Size: 461mm(h) x 145mm(w) x 86mm(d) Colour: Silver. Material: Case: Alluminium. Tools: Stainless steel with rubber grip Product Size: Case: 460mm(w) x 130mm(h) x 80mm(d) Freight details : 6 per carton, 10.7kgs, 48.5 x 34 x 29cms; Decoration Type(s): Colour Print / Full Colour Print / Laser Engrave / Print with Dome Decoration Area: On Badge - Laser: 30mm(w) x 20mm(h). ?Pad: 40mm(w) x 20mm(h). Price includes : 1 Colour 1 Position Print. Setup is included.